The author with a salmon on a two-handed fly rod. Most anglers think that if your lure’s not fishing the bottom you won’t catch many salmon. My first fish caught fly fishing for salmon was taken on a fly rod and line in the Hurunui River. Salmon had been splashing on the surface most of the day. Let’s take a look at genuine fly fishing for salmon as opposed to fishing the Canterbury lure rod. I caught the fish pictured on the swing. I would guess the fly was about mid-surface. Everyone who was spinning was making sure they were bouncing their spinners along the bottom and catching nothing. I put this down to the fact that I could control the depth I was fishing through selecting the right line and by doing so put my fly in front of the fish. Because our salmon rivers flow at different volumes, and at certain times run higher or lower than normal, you need to match the conditions. In selecting a fly line for salmon you will need a shooting head, even if you choose to buy only one fly line this would be it and a type IV. This line is designed for very long distance casting. It is only 30 feet long and is attached to a shooting line which is a fine diameter fly line about the thickness of 30 lb nylon. This helps the shooting head cast further than any other taper because of minimum resistance through the guides. I use a floating backing because I found it easy to mend the line while the shooting head sinks. This slows down the fly and makes it sink deeper. Hi-Speed HiD (type IV) would be the first choice as it would cover most river conditions. It sinks from 3 3/4″ to 6 1/2″ per second depending on line weight. I have used this system in all of our rivers with good success. Another good line to use in smaller rivers or low flows is a wet tip which is a weight forward floating line with a 10-foot sinking tip, this I have in type III which is slightly slower than my shooting head. This salmon was taken on genuine fly fishing tackle from the Hurunui River lagoon. On occasions when the type IV is too fast and the line catches around the stones as happened in the Rangitata River, you need your line to swing with the current so that your fly behaves in a normal manner in swinging across above the bottom, this line would be good for the Hurunui, Waimakariri and Rangitata Rivers but stick to the type N for the Rakaia and Waitaki. Leaders for these systems are very short, about four or five feet, with the weight of the fly turning the leader over, a tapered one is not necessary. I haven’t said much on the line weight but a properly matched line will perform to it’s best without taxing you, my lines are 10 weights as are both of my fly rods, one a 9’3″ saltwater single handed and the other is a 10’6″ double handed. With all the reading I’ve been doing because of the lack of fish-able days I came across an article about the revival of the double-handed fly rods for salmon and with having tried one before I just had to have one. Such a rod will allow the coverage of more water and fish the fly in a more drift like motion with easier mending of the line. It’s the line that puts the fly in the fishes zone. This Yellow Brunton is a modern commercially available salmon fly that is both popular and effective. See also the Yellow Lady. Salmon fishermen are funny people – look through any tackle box and you will see dozens of spinners in different shapes, sizes, colours and weights and boxes of them. I know; I’m one of them. But salmon flies, well, that’s a different ball game. Salmon flies of years ago were great works of art, each feather was married together to form the wing, each part of the fly had its purpose from the golden crest that forms the tail to the topping that runs along the upper perimeter of the wing. If fly fishing for salmon a yellow lure is a good place to start. Yellow lures are easier for the fish to see when there is a bit of colour in the river. They look like gold and cost just as much! Such was the work that went into them. They even had majestic names like Green Highlander, Silver Doctor and Blue Charm along with names like Thunder and Lightning that would send the wariest salmon to its deepest retreat. Like most other things that are related to salmon fishing, as time goes by things evolve. New ways were sought to tie these patterns more cheaply and more suitable to the rivers which are a lot like ours. Typical early English style salmon fly seldom seen today. While the flies still had the conventional look of the English patterns they were tied with bucktail and squirrel tails dyed in various colours, low water patterns in which the whole fly is tied on half the hook only, and as the salmon doesn’t see the hook you still have a hook strong enough to hold a good salmon. A few years ago a tier in Temuka, in South Canterbury, tied a range of hair wing salmon flies. They were of English style and sold very well to those who knew how to use them for fly fishing for salmon. These hairwing flies of today are every inch the highly skilled creations of yesteryear, they are tied so the wing is no longer than the length of the bend of the hook and tied sparse enough so that none of the materials blocks out another. Let’s take a look at our salmon flies, not a lot of history there, big streamer flies that have at one time evolved from trout lures and, don’t get me wrong, these do catch salmon: and catch them they do, in the tail, in the fins, in the belly and across the back. If I need a fish that bad I will go to the supermarket! The Waimak Wizard. 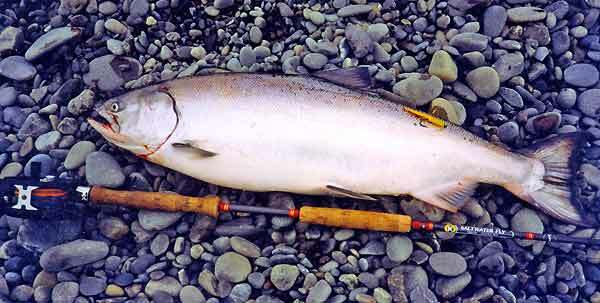 This salmon lure was sold and marketed by Tight Lines Limited.